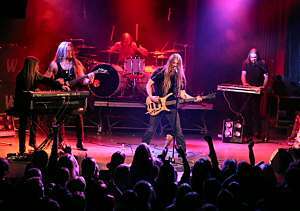 The finnish real men-band Tarot will always remain a band that has their own image and the image is only fueled by the words from loyal fans, praising this harsh and heavy group to the skies with a passion. That passion is always present at Tarot's gigs, drawing hundreds of fans to see them each time and living the songs with the band, who appreciate their fans and never let them down with their show, always giving a very balanced show. Nosturi was the scene for Tarot's show this time and the atmosphere was high up in the roof again. The strangest thing was the supporting band Manitou, playing their proggish metal leaning towards traditional prog at times. Their music was quite heavy though, but I had to wonder about the decision putting them to support Tarot. Simple metal together with prog ? 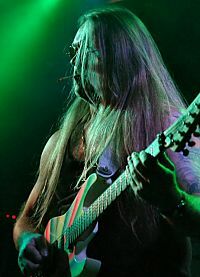 The fans of Tarot mostly appreciate the true, traditional and simple way of metal, not the scales you can play with your guitar. Of course there's Tarot fans who love prog too, but the majority is intrigued by the old school metal. So Manitou didn't get the best reaction from the crowd with their Dream Theater-clichés, but they still played a pretty good show, not with the best sounds though. Their singer definately has a sound of his own, which didn't always work with the songs, and the band ended up sounding like prog metal combined with this harsh sounding singer from an old, seventies hippie prog metal band. But the band is going strong, they have an album coming out next year. And since they raised a little interest in me, it will be interesting to hear what's the deal there. the break Tarot took the stage with a storm. "I Rule" hit the air with such power the fans in the front row had to have earplugs. I didn't have mine and boy, was it windy inside my head next to the speakers ! But the guys were once again taking the stage with great energy and profession, and the fans brought more energy for the guys, screaming and singing along. 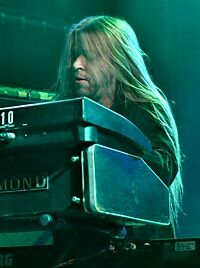 "Warhead" continued in the same spirit, Marco Hietala singing like the vocal God he is and the rest of the band playing tight. The set was a bit different and longer (over an hour and a half) than seen in their earlier shows with rest of the songs being Midwinter Nights, Descendants Of Power, Pyre Of Gods, Wings Of Darkness, Follow Me Into Madness, Undead Son, Convulsions, Angels Of Pain, Do You Want To Live Forever?, Rider Of The Last Day, Crawlspace, The Punishment, Beyond Troy and a Blue Öyster Cult cover "Veteran Of The Psychic Wars" sung by Tommi "Tuple" Salmela, which was a great performance and Tuple got some attention from the band and the fans. Tarot had great sounds and the place was full, which was still hard to believe, since the metal fans in Finland seem to be a bit lazy these days to go to shows. But it was one more victory to the Tarot books, and my evening was perfect, and so it was for many others who came to see the show. 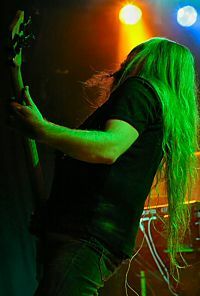 Tarot even convinced a metal fan, who never saw them live before and the audience was packed with musicians from other bands such as Jorg Michael, Jari Kainulainen and Timo Kotipelto (Stratovarius), Kaasu (HIM), Nino Laurenne (Thunderstone), Arkki (Impaled Nazarene), Tero (Battagia), Tuomo Lassila (ex-Stratovarius, Conquest), Peter James Goodman (Conquest), etc. Goes to show if you're good, you also get the perfect audience ! 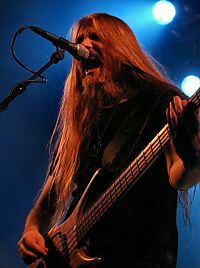 Marco Hietala kept his usual speaches between the songs, some like them and some don't, and "The Punishment" was the moment where the audience needed some discipline and had to turn their backs to the band. Obviously the crowd was curious or knew what was going on and did what was asked. No harm done with a little fun added in the game, it only spices up the show some more and hardly any band comes up with things such as this, it's always the usual sing along or whatever. When Tarot left the stage the crowd would've wanted more, but it was already really late and the band gave their best. When you talk about Tarot, no words are enough to describe the feeling they give you in a live show and how incredible these guys are. I always walk out with a satisfied smile on my face and I'm not the only one.